Over the last few months, we’ve been giving you an inside look at our fastest growing business segment, domestic embroidery. We’ve introduced you to your Account Leads, and Sample Specialists, and gave you tips and tricks from our expert Graphic Designers. Today, we’re going to look at how both custom and stock embroidery can benefit the Team headwear industry. OC Sports has a catalog of stock artwork you can choose from for high-quality looks and quick turnaround times. We have stock lettering, mascots, sports icons, and name drops. You can find examples of all of these throughout this article. After you choose a design from our stock artwork, you simply choose your cap, select the location you want your logos, as well as 3D or flat stitch, and pick out your team’s colors. Stock embroidery ships seven days after we receive your order. You must order a minimum of 12 pieces per style, color, and logo. We also allow you to customize your headwear with original embroidered mascots and team logos. OC Sports has a team of expert designers and digitizers to help you bring your team’s dream cap to life. If you have your own one-of-a-kind design you want to use, you can email it to us with your contact information, fonts, and Pantone colors. Vector art is recommended. Vector files typically end in .ai, .eps, .pdf, .svg, or .cdr. If you need help creating your team’s custom logo or mascot, let our knowledgeable and friendly Custom Embroidery Service Representative assist you in developing your unique design. We can start from scratch or give an outdated design new life. 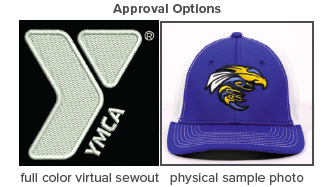 You custom team embroidery order ships seven days after you approve the final sample via email. Orders greater than 288 pieces may require additional lead time. You can choose whether you prefer a full color virtual sewout or a photo of a physical sample. Virtual sewouts are emailed within one business day, and sample photos are emailed within two or three business days. If you choose to only embroider lettering on your team’s cap, we waive the set-up charges for 1-3 letters and 1-2 thread colors. All new custom designs require a minimum order of 48 pieces per style, color, and logo. Orders of 12-47 pieces will incur a $100.00 set-up charge, which includes artwork, digitizing, and emailed samples. Don’t forget to check out the other articles we’ve published on our domestic embroidery operations. You can follow OC Sports on Facebook, LinkedIn, and Twitter.